The Eastern Archaic faunal working group funded through our NSF grant uploaded about 60 faunal databases for 24 Archaic Period sites in our study area in the Digital Archaeological Record (tDAR). An international repository of digital data, images, and documents, tDAR (www.tDAR.org) is maintained by Digital Antiquity and hosted by Arizona State University. We chose to upload our data into tDAR because of their digital archiving capability and long-term commitment to preserve and provide open access to the data. We used the mapping and integration tools in tDAR to compare datasets developed by different researchers who used different coding formats. When our databases are released in tDAR at the end of our grant project, they will be accessible to researchers across the world. We uploaded our original databases into tDAR. The tDAR repository does not require that all databases follow a standard format. Even individual researchers in our project used multiple coding formats for different seasons of excavation and different sites. To make databases comparable, we had to match (map) our attributes for variables to ontologies. An ontology is an agreed upon listing of attributes for variables. For example, we created an Eastern United States Taxon Ontology for tDAR that includes all the scientific names for taxa (kinds of animals) in our study area. 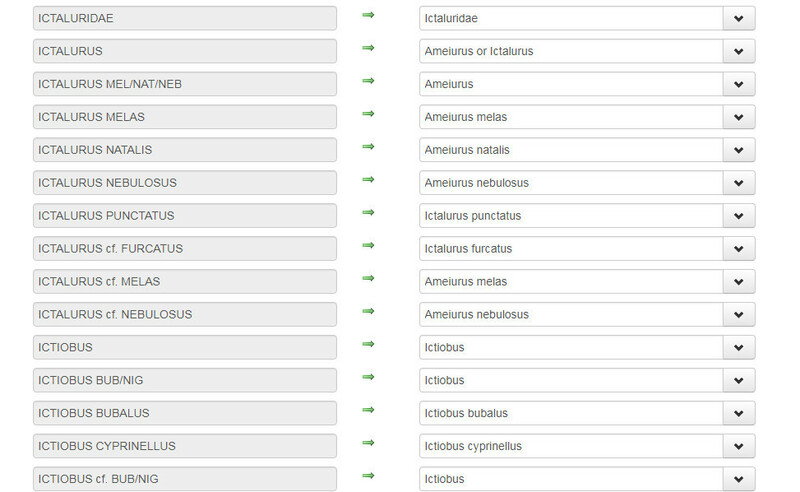 The names of taxa in the tDAR ontology follow the Integrated Taxonomic Information system (www.ITIS.gov). As another example tDAR had a Burning Intensity Ontology. For Modoc, the possible attributes for the burning variable included unburned, burned red, burned black, and calcined. The tDAR ontology attributes included unburned, singed, charred, and calcined. The tDAR mapping tool provides a list of all the unique categories for attributes that were used in the original researchers database. The unique attributes only had to be mapped once instead of each time they appeared in the database. We mapped unburned to unburned. We mapped red to singed. We mapped black to charred. We mapped calcined to calcined. Many of the researchers on our team coded burning intensity as unburned, burned, or calcined. They informed us that the attribute "burned" indicated that the bones were blackened. Most of the researchers on our team did not code reddened bones as burned. So for many of the databases, we mapped unburned to unburned, burned to charred, and calcined to calcined. For some researchers a blank in the burning intensity column, meant that the bone was unburned. Knowing the attribute codes for each variable was critical to the mapping process. 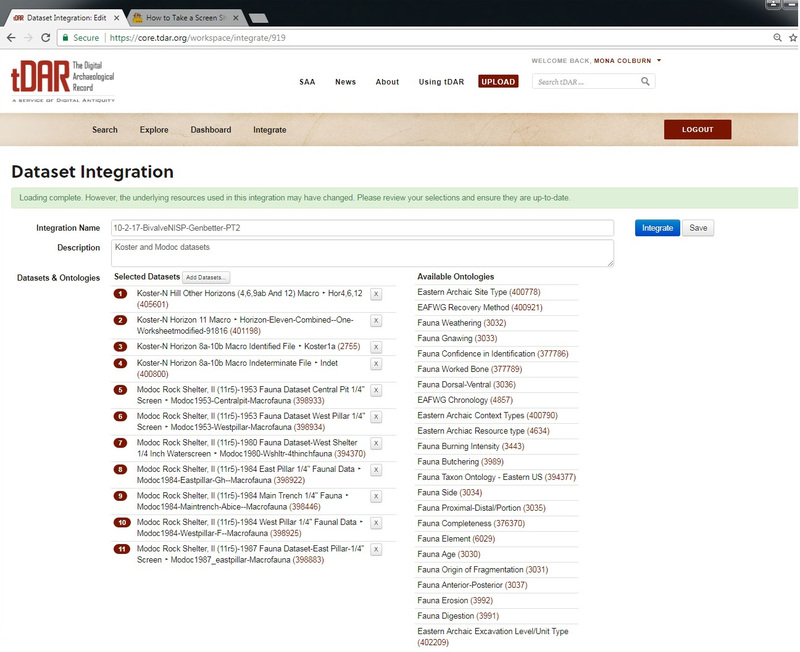 This screenshot shows the entry page for the tDAR integration tool. For this example, we have selected the Koster and Modoc Rock Shelter databases that we want to compare. The list on the right side of image shows all of the tDAR ontologies for variables that we may compare in these databases. We previously mapped the attributes used to code the variables in each of these databases to agreed-upon listings of attributes for each ontology. Any attribute that has been mapped to a tDAR ontology, can be compared across sites using the tDAR integration tool. For example, you can compare how many bones for each taxon or groups of taxa were charred or calcined. tDAR produces a new excel spreadsheet with your results. The tDAR mapping and integration tools allow you to compare sites. We created some new ontologies to compare our sites such as an Eastern Archaic Faunal Working Group Resource Type Ontology. The Resource Type Ontology allowed us to group individual taxa into meaning categories. For example, we combined all the species of semi-aquatic mammals into a category of aquatic mammals. To map to the ontology, we simply duplicated the column that gave all the taxonomic identifications in our original databases and mapped the individual species to the resource type attributes in the ontology. In this case, we mapped species such as muskrats, beavers, and river otters to the resource type of aquatic mammals. We also created an Eastern Archaic Faunal Working Group Cultural Chronology Ontology, that allowed us to designate cultural affiliations and group deposits from the same time period within a site. To map to this ontology we often duplicated the strata or horizon variable in the original database. This ontology will be explained in the Past Environments section. This screen shot from one of our tDAR databases for Modoc Rock Shelter shows the mapping process for mapping the taxonomic names in our original database (names in left column) to the appropriate selections in the Eastern Archaic Faunal Working Group Taxon Ontology (names in right column). A few examples will make the process clear. The coding for the 1980s Modoc Rock Shelter faunal taxa had used scientific names in the Integrated Taxonomic Information system, but some of the names of species had later been updated in the Integrated Taxonomic System. The attributes (in this case names of taxa) coded in our original database were not modified, and tDAR created a new translated database with the updated names that are comparable for all the datasets in our project. When we uploaded our databases into tDAR, we also entered the attributes for each variable that we used in our original databases. This step is extremely important, especially if researchers used any abbreviations or numeric codes for attributes. To compare variables at sites, attributes for those variables for each site must be mapped to those in a tDAR ontology. We also created an Eastern Archaic Faunal Working Group Cultural Chronology Ontology, which allowed us to designate cultural affiliations and group deposits from the same time period within a site. To map to this ontology we often duplicated the strata or horizon variable in the original database. This ontology will be explained in the Past Environments section. This screenshot shows the selection of variables to be compared. We had previously selected the Fauna Taxon Ontology and checked which taxa we wanted to include. We are in the process of selecting the time periods we want to compare using the Eastern Archaic Faunal Working Group Chronology Ontology. The check marks on the right side of the image show which time periods are represented in each of our databases. To complete the integration we will add the Count Column and specify the kind of count for each database. This integration will give us counts for the taxa selected for each selected time period for each database. The integration creates a new excel database with the results.